The wildfires are releasing tons of pollutants into the air that will linger long after the fires are put out. Hazardous chemicals that may be present in building structures or products – such as asbestos insulation, vinyl materials, plastics, electronics casings and flame retardants – are released into the air as these things burn, creating airborne carcinogens. The extremely fine particles in soot and smoke harm our lungs. The particulates can trigger symptoms like difficulty breathing, coughing and headaches, or worsen respiratory diseases, like asthma. They also can damage the heart, circulatory system and brain. Although the poor air quality puts everyone at risk, children, the elderly and people with asthma, cardiovascular or respiratory diseases are particularly vulnerable. People in these groups should take extra precautions. Exposure to air pollution during pregnancy can affect thyroid hormone levels in the developing fetus, and may contribute to reduced birth weight, preterm birth and a greater risk of chronic health conditions later in life. Monitor your local air quality using resources like the EPA’s AirNOW website, and pay attention to air quality reports and advisories posted by your local government. You can also search AirNOW using your zip code to learn more about your air quality. Remain indoors when you can. Keep indoor air as clean as possible. Avoid smoking, and cook without generating fumes. If you have a central air system, make sure it’s fitted with the highest-rated filter it can accommodate. The American Lung Association recommends using filters with Minimum Efficiency Reporting Value, or MERV, of 10 or higher. Also, operate the central air system with the fan on to ensure constant movement of air through the system. Replace HVAC filters frequently so they work with maximum efficiency. Consider a portable air cleaner to use in bedrooms, children’s rooms and nurseries. 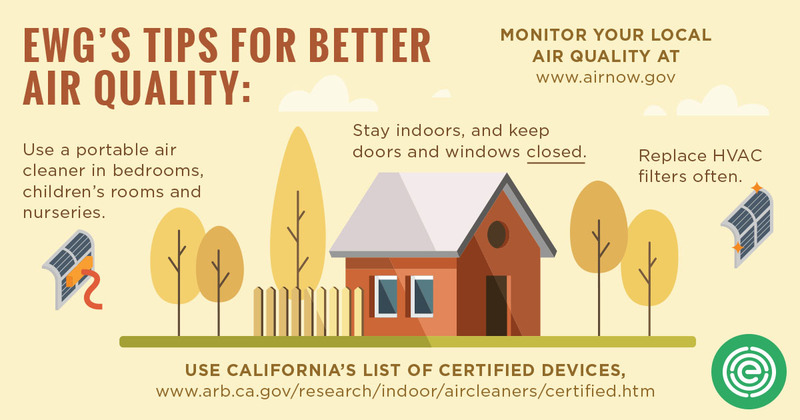 California’s Air Resources Board has a list of certified air cleaners here. We recommend air cleaners equipped with a high-efficiency, or HEPA, filter. Beware ionizing electronic air cleaners that may intentionally produce ozone, a potent respiratory irritant and the main component of ground-level smog. When you have to go outdoors in an area with polluted air, consider wearing a face mask or a respirator labeled N95 or P100. These can be found at most hardware stores and will help to filter out the fine particles in smoke. Consult the California Department of Public Health’s tips to make sure you’re using your mask correctly and maximizing protection. Whether you’re inside or outside in one of these areas, avoid vigorous activity. In extreme cases, consider leaving the area until the air quality improves. More information on this topic is available in EWG’s Healthy Living: Home Guide.